I have a bunch of projects on the go this week and I'm having trouble deciding from one day to the next which one I should work on 😊 Does that ever happen to you? Last Christmas I gave the kids I babysit personalized placemats and a few weeks ago one of the moms asked if I would make 3 more for the rest of the family and 4 unpersonalized ones for when they have company. 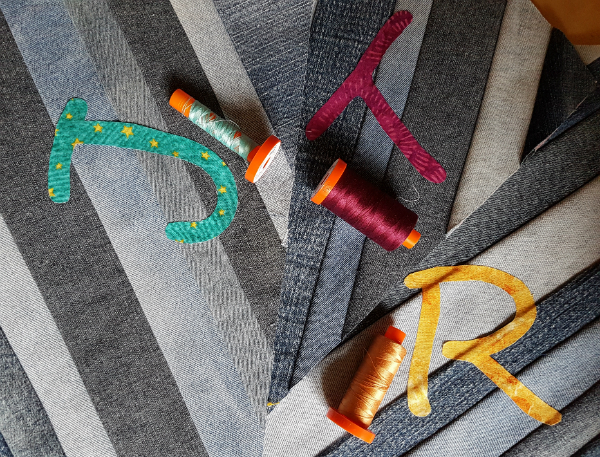 The denim is all pieced, the letters are fused and the Aurifil threads are picked out. Now I just need to zig zag stitch around them and they'll be ready for basting. 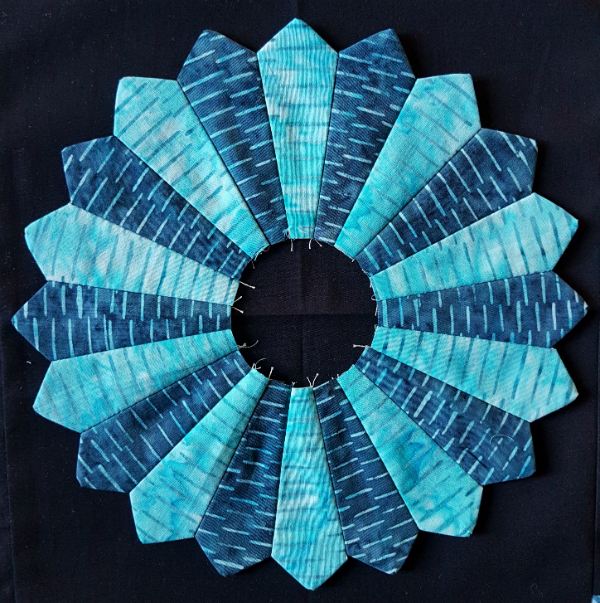 The Island Batik challenge for this month is to use log cabin blocks, so of course it makes perfect sense that I started with a dresden plate, right? 😄 I completely missed the spinning effect created by the print until I posted the picture on IG and someone pointed it out to me. Bonus! 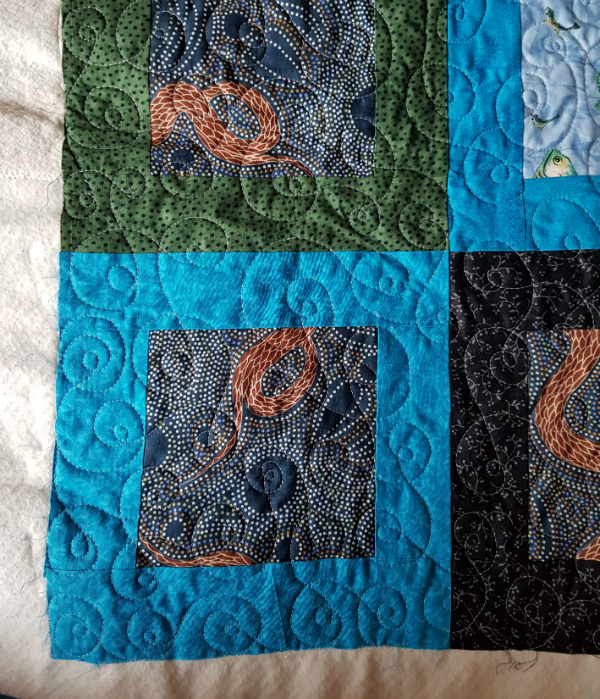 There will be a log cabin involved in this quilt, I promise, just as soon as I can get it pieced, lol. 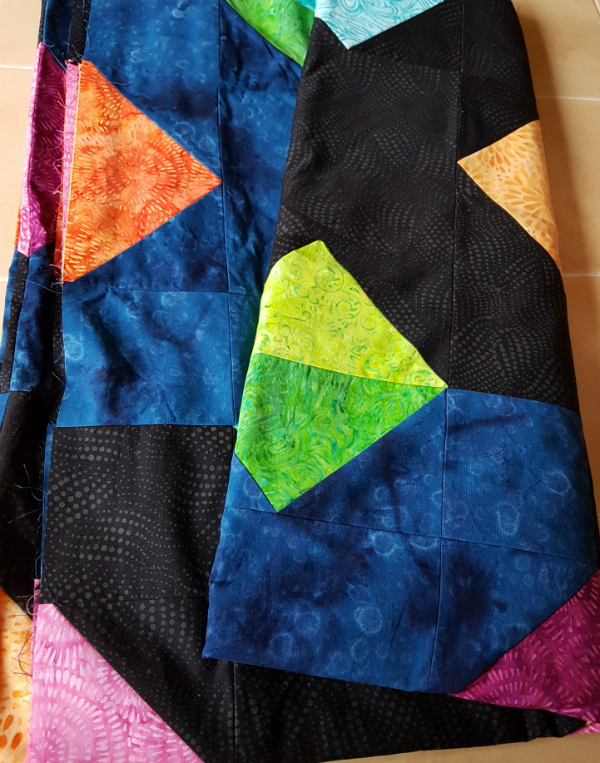 I have the top pieced for our new bed quilt and I am soooo in love with it! 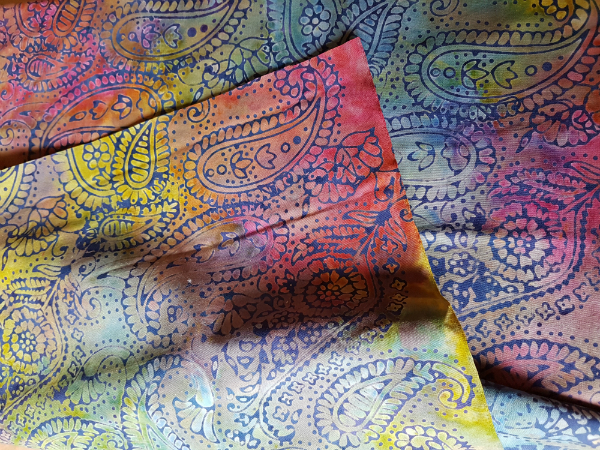 These are all Island Batik fabrics too and I'd be hard pressed to pick a favourite. Could I have a full bolt of all of them, please?? Time to make the backing...and for this I did actually have the full bolt! What a nice feeling to crack open the plastic on my first ever full bolt. Queen size quilts take a lot of backing fabric, so there wasn't much left after I cut what I need. I think I'll use what's left as the backing for the placemats. 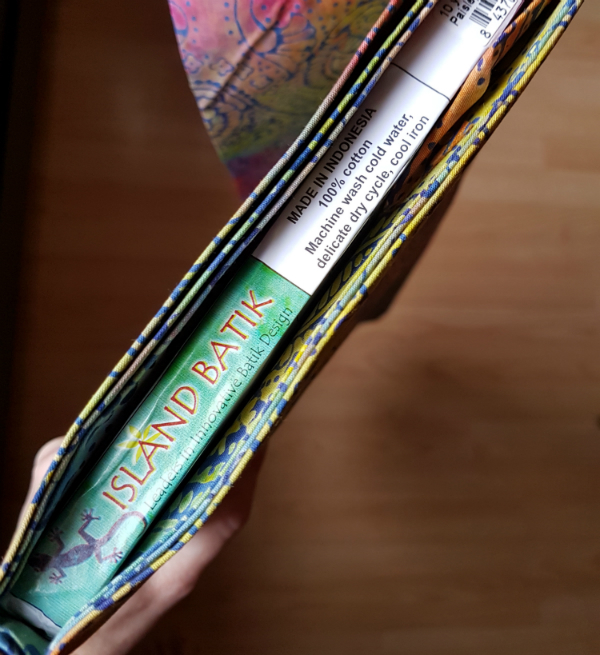 Isn't the Island Batik gecko cute? As I piece other things, I'm also working on my leaders and enders project. 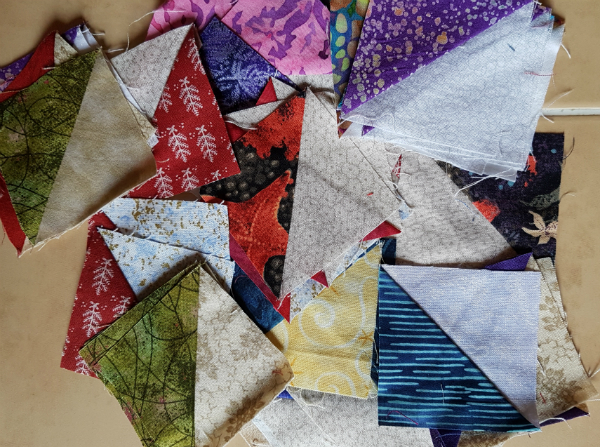 I'm making 2 ½" HSTs from light and dark scraps and my collection is definitely growing. Of course, I need hundreds of them, so the bag I have so far is barely a drop in the bucket. On top of all that, I'm also still working on my two hand stitching projects 😊 We have a 4 day weekend coming up and Zach has basketball out of town two of the days. 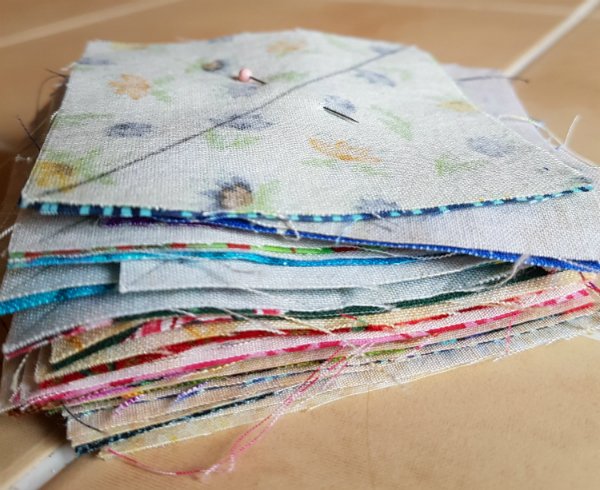 I'm not looking forward to all the time driving, but at least I'll get to do lots of stitching on the green round of my hexie rainbow quilt. Phew! At least I won't be bored, right? You do have a lot going on, and they all seem to be fun and making great progress. I love the spinning effect that the prints have in the Dresden, too! You have a lot of really fun things going on, and you seem to be balancing them all well. The first time I saw that dresden I thought you had done some circular big stitching on it. It is really pretty! Looking forward to seeing it with the log cabin blocks.